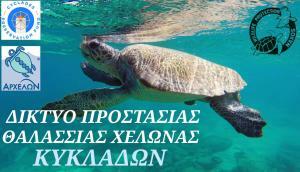 The CPF together with ARCHELON, the Sea Turtle Protection Society in Greece and the Association for the Protection of Wildlife in Naxos, organizes informative meetings in collaboration with port and coast-guard authorities on the islands of Syros (16/4 at 2pm), Paros (17/4 at 12pm) and Naxos (18/4 at 11am). The meetings will be hosted by the local coast-guard authorities of the above mentioned islands and they are open for fishermen, representatives from diving centers, nautical clubs and any other local association or union or company or individuals with related interests. During the meetings we will demonstrate first aid guidance for injured sea turtles and discuss about the challenges for these important wild animals in the area of the Cyclades as well as about their interaction with humans. The goal of these meetings is to map our potential allies in the joint efforts to establish and enhance a local network for monitoring and protection the sea turtles in the Cyclades. Join us!